The following step by step is for a Silver Sparkler. If you need materials for the other variants just click the images above for the gold and pearl sparklers. This is one of the simplest flies to master. The only area that you need to pay a lot more attention to is the wing. It needs to be tied in very tight and the head must be not too bulky. A bit of practice is all that is needed until you master it. 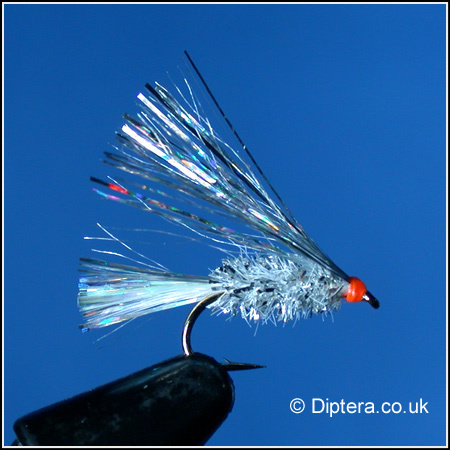 STEP 1 : Run the thread down the hookshank, catching in a bunch of the Silver and Pearl Flash mix as you go. Return the thread to a position near the eye. STEP 2 : Now take a piece of Silver Diamond Chenille (This should be no more than 6mm in diameter). 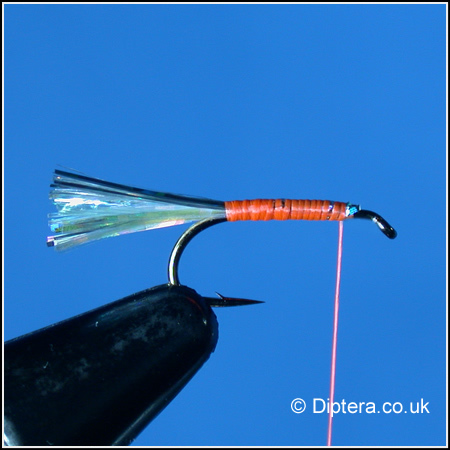 Strip the chenille / fritz fibres off part of the core (about the length of the hopokshank) and catch in the bare core down the hookshank until you reach a position opposite the barb. (stripping the core this way I find keeps the bulk on the body to a minimum). 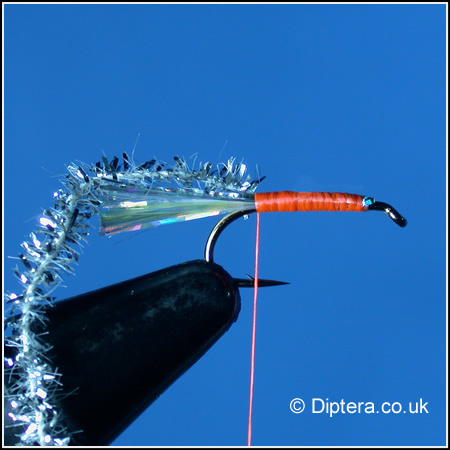 STEP 3 : Return the thread up to the eye and then wind the diamond chenille up the hookshank. 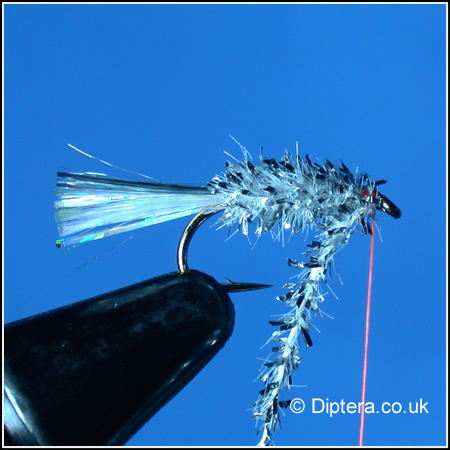 After each complete wind, brush the fibres back with your finger so they aren't trapped under the next winding. (Wet you finger if you wish). At the eye, tie off the chenille and trim any waste. Now perform about 4 wraps away from the eye so that you have a base to tie in the wing. Now take a bunch of Silver and Pearl Flash mix and trim it so that it each strand is equal at the tie in end. Now place the flash mix ends over the tie in point and perform one wrap of thread, then the second pulling quite hard down to secure the wing in place. Now continue winding to create a neat head. Whip FInish, cut away thread and varnish the head. The final procedure is to cut the wing and tail if required. I normally trim the tail first to the length I require and then pull the wing back, laid flat over the top of the body and trim to the same length as the tail.